Play of the Day: Will the Mueller Investigation End Soon? When Christine Blasey Ford publicly alleged that the Supreme Court nominee Brett Kavanaugh sexually assaulted her in high school, the White House immediately rejected calls for an FBI investigation. 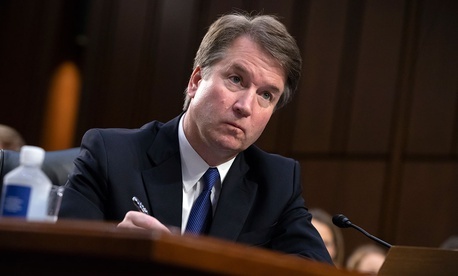 It refused to treat Ford’s claim as a “vetting” issue and instead committed to a fully political defense of the nomination. This was a fateful mistake, which the Republican leadership seems poised to repeat now that more allegations against Kavanaugh have surfaced. Senator Chuck Grassley, the chair of the Senate Judiciary Committee, has indicated that he will examine the new questions in the same fashion as the old, with an offer of closed-door interviews or a public hearing. How can the White House counsel’s office prepare Kavanaugh for a defense without an independent examination of the facts? The White House has not reviewed in detail what Ford has to say, instead relying on the letter Ford wrote to Senator Dianne Feinstein and the short statements from the other witnesses she has identified. In the case of the new accuser, Deborah Ramirez, all anyone has for now is reporting in The New Yorker and other publications. If and when a Senate hearing actually takes place, it will be far less informative than it might have been. Granted, it will provide an opportunity for Kavanaugh, Ford, and perhaps other accusers to present their position publicly and allow senators to weigh their conflicting accounts. But a Senate hearing is not a forum for rigorous fact-finding. Lawmakers are not uniformly suited to the role of professional interrogators and, in the absence of an independent, baseline investigative record, they will stage what may turn out to be mostly a spectacle for television. It’s not terribly surprising that, in the absence of a thorough investigation, Kavanaugh’s allies have tried to fill the void, but these efforts have so far been calamitously counterproductive. I refer, of course, to Ed Whelan’s “mistaken identity” argument, which he outlined on Twitter. Whelan has since deleted the tweets, apologized, and taken a leave of absence from the Ethics and Public Policy Center, but the story won’t end there. At their first opportunity, Democratic senators will ask Kavanaugh what he knew of this badly misconceived and executed undercover operation. Yet another consequence of the White House’s abandonment of the background investigative process is the possibility that even if Kavanaugh is confirmed, others will pursue what the FBI has not. There’s already been some discussion among Democrats of an impeachment proceeding if they regain control of the House. Others have suggested a referral in the Ford matter to Maryland criminal-enforcement authorities. The cost to the Supreme Court in either case is incalculable. An FBI investigation would not necessarily deter outraged Democrats or accusers from going in these directions, but the White House’s absolute refusal to authorize independent fact-finding has only fueled the demands for a credible resolution somewhere, now or later. The White House, Grassley, and other top Republicans may believe that by spurning standard background investigative procedures they’re avoiding a delay. Their top priority has been speed. But the consequences of not ordering an FBI investigation are worse than a postponement, and the accumulating mass of charges and denials may produce more delay than an expedited FBI review. Over the period that the White House and Judiciary Committee majority have been jousting over the terms and conditions of the public hearing, the FBI could have already done much of what needs to be done — such as conducting some if not all of the interviews of the individuals identified as potential eyewitnesses. Sometimes the best politics is fully consistent with good government. With the emergence of new allegations, the White House could change course and order a high priority, fast-paced but responsible investigation, or once again push ahead, leaving the outstanding factual questions to the ceaseless war of words between the opposing camps. The latter route would be unfair to Ford and other women who may wish to be heard, but also disastrous for Kavanaugh, the White House, the Senate, and the Supreme Court.